You read that correctly. We are having a Happy-Birthday-Jane-Merry-Christmas Giveaway! December is a bursting month of reasons to celebrate. I would have added in Yule and Kwanzaa, but there’s only so much room in a title before it doesn’t even fit. We realize that we have quite a few international dark readers who keep up with us, and we appreciate each and every one of you. Unfortunately, this giveaway is only open to those with US mailing addresses. So what is in the Happy-Birthday-Jane-Merry-Christmas giveaway pack? The contest begins today and will run through this week ONLY. The Winner will be announced Monday, December 16. 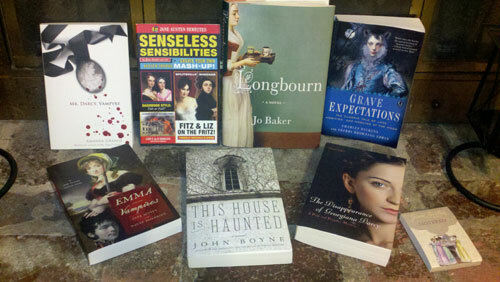 Yes, that would be our dear Jane Austen’s birthday, but the presents are for you! With any luck they will go into the mail and be to you by Christmas.